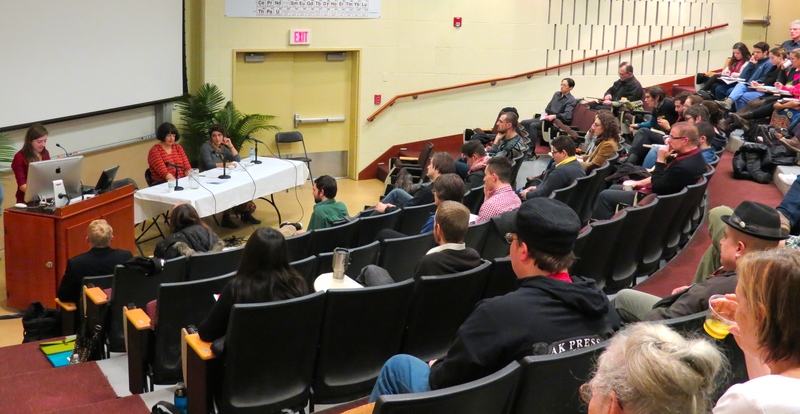 Because of my interest in anarcho-syndicalism and my connection to Swarthmore College, a participant in the Tri-College Consortium, I could not miss the opportunity to attend this Mellon Symposium. 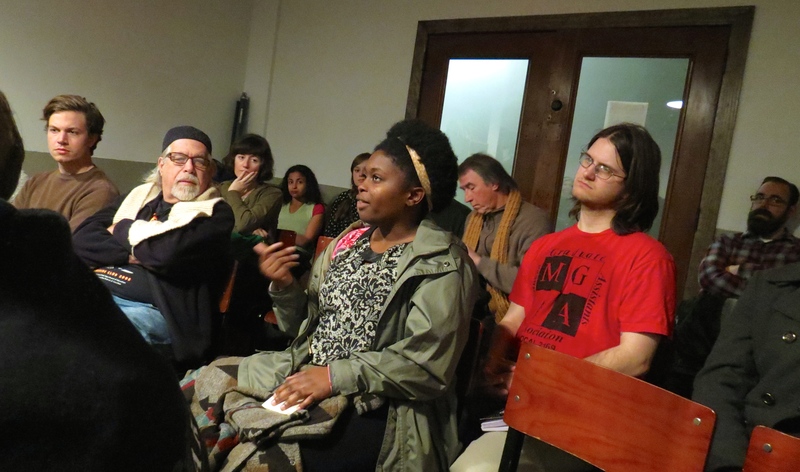 Andrew Cornell, Mellon Postdoctoral Fellow and Visiting Assistant Professor of American Studies organized the event, which featured a group discussion on “What We Mean When We Say . . . Anarchism, Decolonization, Radical Democracy,” and then broke into three panels: Limits of Liberal Democracy, Self-determination without a State? and Putting Principals into Practice. 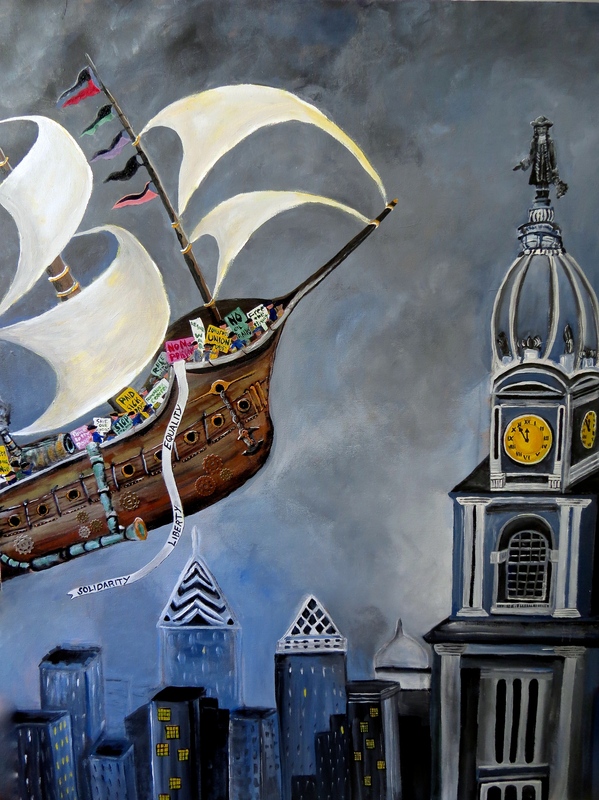 Each discussion began with an acknowledgement that we occupy the lands that once belonged to the Lenni-Lenapi tribes that lived in eastern Pennsylvania before being driven out by the Europeans. The organizers and scholars presented compelling presentations, explaining the extent to which colonization frames the social and economic circumstances that we find in societies today. I was not familiar with the current events surrounding the Kurds defense of their homelands against ISIS in Syria so I was very much interested in learning more during Dilar Dirik’s presentation. Dilar, A PhD candidate in the Sociology Department of the University of Cambridge, is an activist and advocate of the Kurdish Women’s Movement. Dilar is from Rojava territories within the borders of Syria. The Kurds in Syria are fighting to prevent a takeover of their homelands by the Islamic State militants or ISIS, but the YPJ in Syria is loosely associated with the PKK in Turkey, who oppose and resist Turkish rule over the northern Kurdish region. The United States maintains a policy that is favorable to Turkey, a NATO ally, and in support of Turkey, rejects the self-determination of the Kurds because Turkey does not want to lose territory to a Kurdish independent state. In addition, the PKK originally had a communist ideology. The Kurds’ attempt to organize stateless communities in Norther Syria, called the Rojava Revolution, is often compared with the Zapatista’s experience in Chapatas, Mexico. The YPJ has made efforts to initiate democratic reforms that represent the interests of the people.The Kurds in Syria and their YPJ Star militias are making heroic efforts in a war-torn country for self-determination and receive no support from the Western powers. 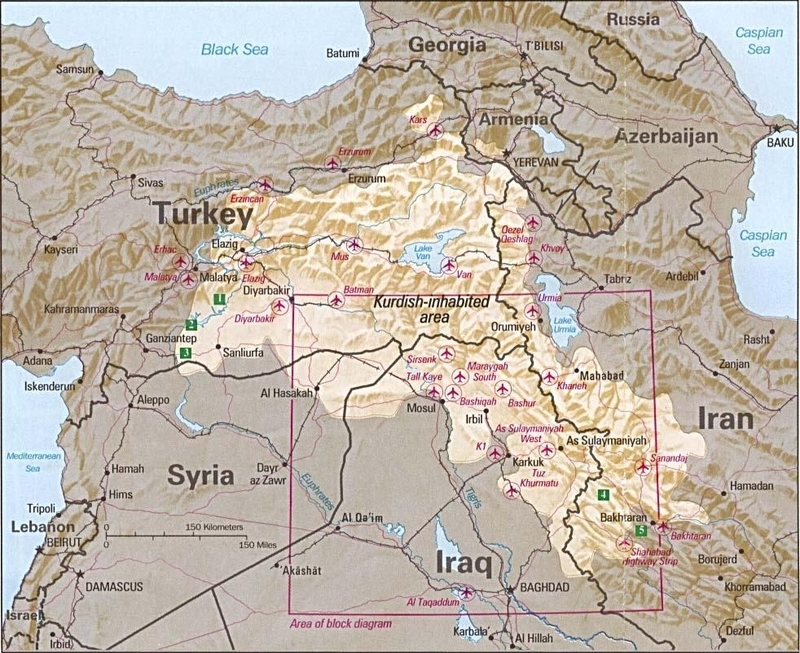 Now that the US, of necessity, is backing the PYD against ISIS, what will become of the Rojava autonomous zone? Once ISIS is defeated (insh’allah! ), will the PYD ultimately be crushed in deference to Washington’s ally Turkey? It can seem that the PYD stands an almost inevitable chance of being betrayed—as both anarchists and Kurds, two groups that have historically been subject to serial betrayals. When the US labels a group as terrorist, we think of al-Qaeda and ISIS, and yet our diplomatic corps has deemed that the Kurds in Syria should also be labeled “terrorist.” The YPG considers itself a democratic people’s army and conducts elections to select their officers. What most of the West does not realize is that the women, long marginalized, have begun to organize around feminist issues. The YPJ (Women’s Protection Units) is the female brigade of the YPG. They do not however, want to perpetuate the old forms of government and power, and are seeking to establish communities that achieve equality with men. 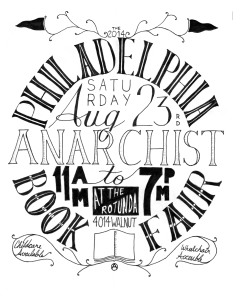 No one can seem to recall if there has ever been an anarchist book fair in Philadelphia, but no matter, because on August 23, dozens of vendors and organizations came together at the Rotunda to offer a selection of literature for the discerning minds of progressive activists. 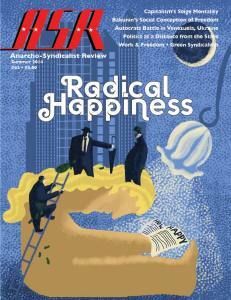 If you are new to anarchism, you might believe that anarchists are a bunch of bomb-throwing lunatics. Please park all your preconceptions at the door. 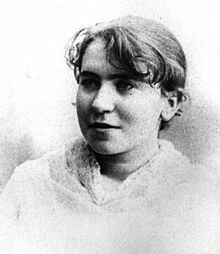 Anarcho-syndicalism best explains my political philosophy where workers’ solidarity, direct action and workers’ self-management form the basis for encouraging workers to free themselves from the hierarchical systems of bosses and managers. 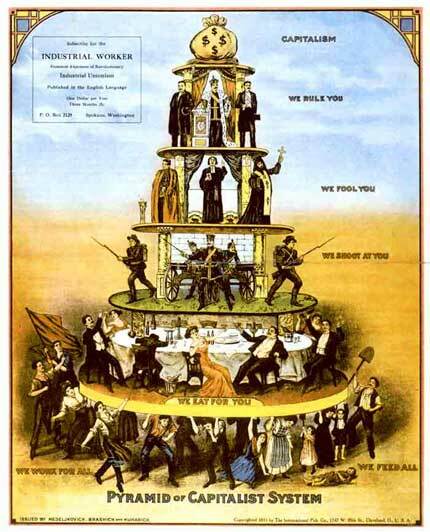 In the ideal economic system, workers control the means of production and manage all aspects of their company. Workers make decisions collectively. 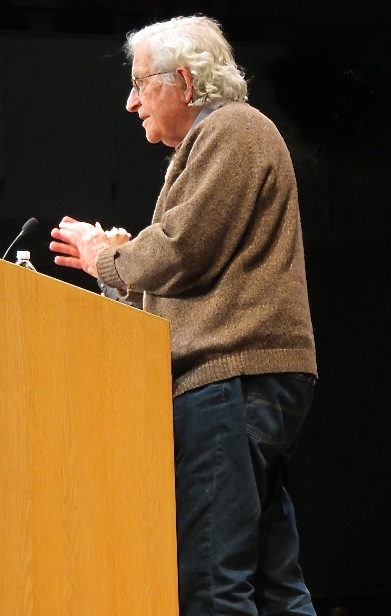 Today Noam Chomsky, intellectual, MIT professor and author of over 100 books, is one of the most famous anarcho-syndicalists. If you have ever felt that your boss or your company was ineffective, bullying or stingy with wages, you might just be an anarcho-syndicalist. I stopped at most of the displays, buying a t-shirt from the Lehigh Valley I.W.W, another t-shirt from Bindlestiff Books and coffee from Red Emmas. Representatives from other organizations, such as Philly Antifa, NYC Anarchist Black Cross, Marcellus Shale Earth First! and the Wooden Shoe answered questions and suggested reading materials. Most booths gave out free materials. Entrance to the fair was free and pizza and coffee provided, with donations accepted. Speakers presented talks throughout the morning and afternoon. I attended a lecture by Jon Bekken, who is on the editorial collective staff of the Anarcho-Syndicalist Review, an independent syndicalist magazine published since 1986. Jon gave an informative overview of anarchist economics, fielding questions from the audience. The video offers a few excerpts from that discussion. 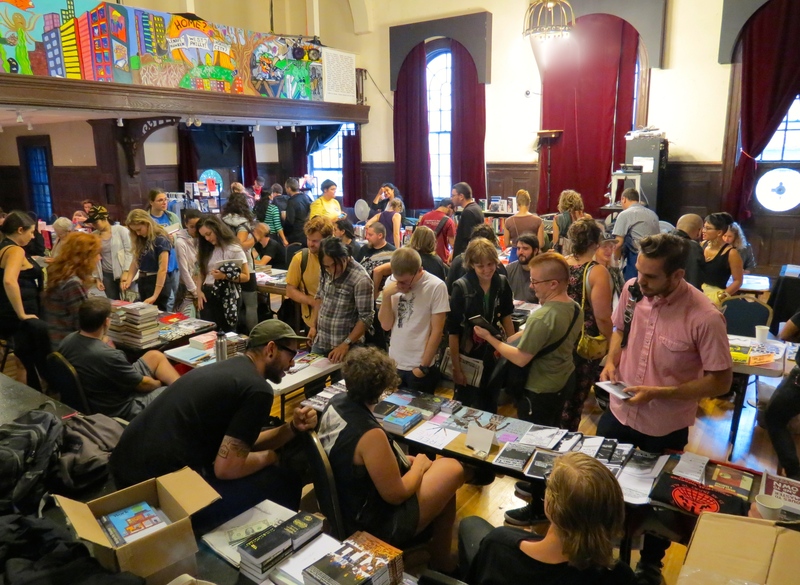 The book fair organizers hoped to challenge preconceived notions of anarchism and “move toward a world based on freedom and mutual aid.” With the number of vendors, the great turnout from the community and the workshops and discussions, I would say the fair had been a resounding success. The fair closed early so that participants could attend a vigil in Clark Park for Mike Brown and the people of Ferguson, Missouri. 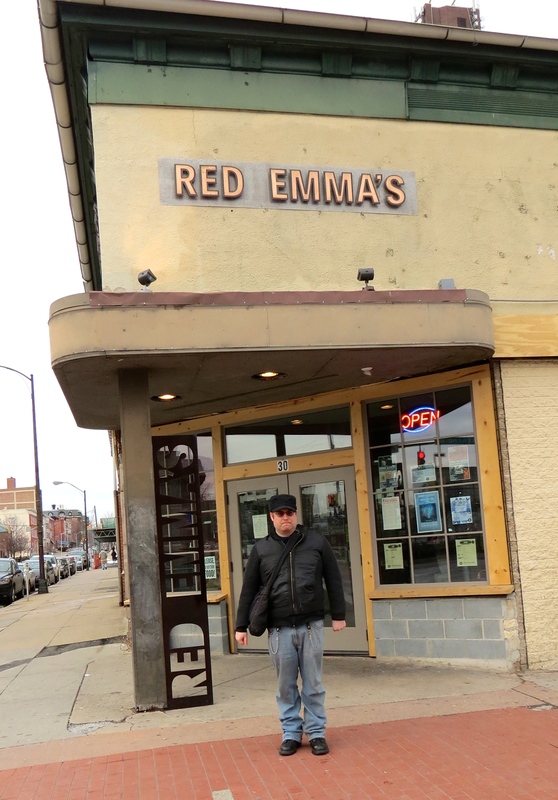 speaking at Red Emma’s the very next day. 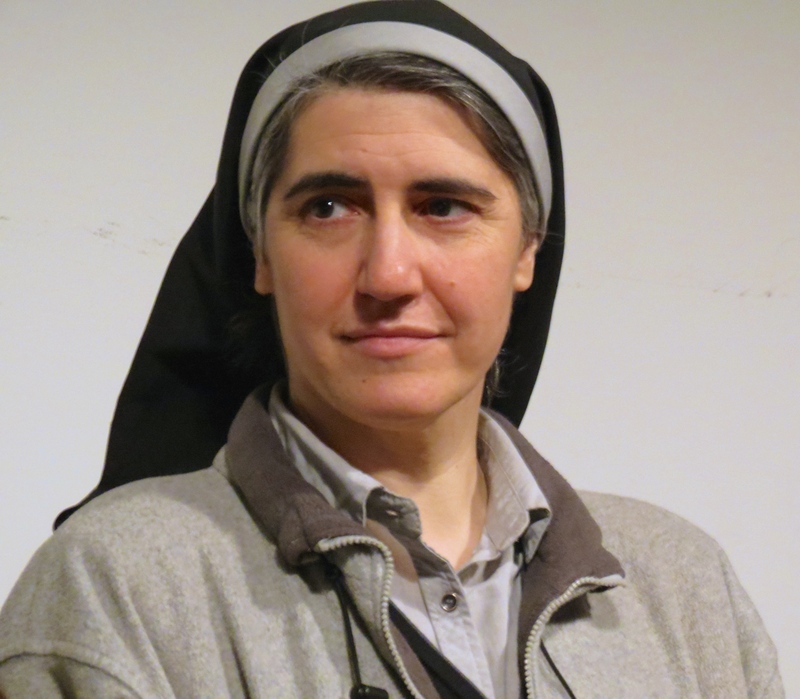 While I was in Barcelona, Spain, I attended an event, Women, Spirituality and Social Change, and met Sister Teresa (see post here), so to have an opportunity to see her again right in our neighborhood of the world, I wasted no time getting train tickets my son John, who writes for The Industrial Worker, and me to travel to Baltimore. Red Emma’s, a worker cooperative started in 2004, supports a bookstore, restaurant and community space and is “dedicated to putting principles of solidarity and sustainability into practice in a democratic workplace.” The namesake of the cooperative, Emma Goldman, a political activist known for her promotion of anarchism, is another woman I admire for her progressive views on women’s rights, prison reform, racial equality and right to organize our workplaces. Anarcho-syndicalism best explains my political philosophy where worker solidarity, direct action and worker self-management form the basis for encouraging workers to free themselves from the hierarchical systems of bosses and managers. Several years ago, John, along with fellow members of the I.W.W., paid a pilgrimage to Emma’s final resting place, Forest Home Cemetery, in Forest Park, a suburb of Chicago. Emma had been deported years before her passing, but officials of the immigration office allowed her burial on U.S. soil. Other activists are buried nearby, so she’s in good company. Teresa Forcades launched a political manifesto to counter austerity measures by the Spanish government. 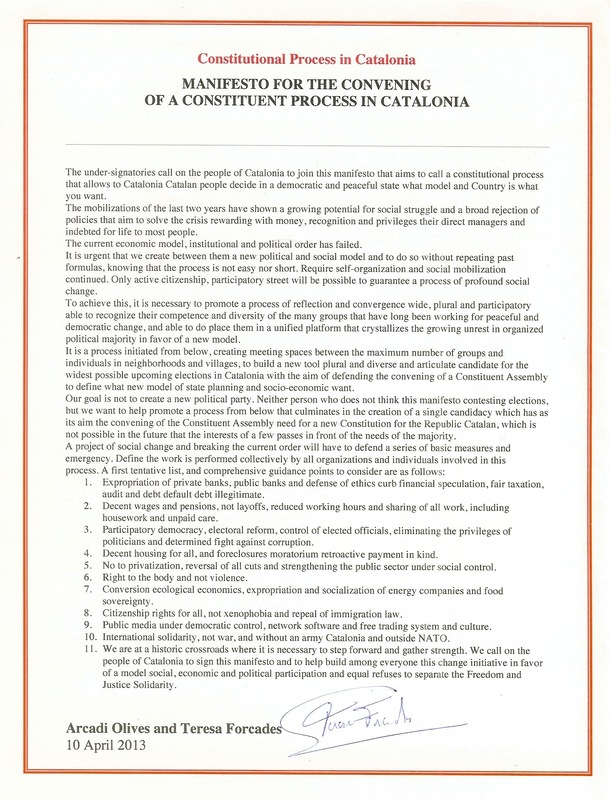 The document calls for an independent Catalonia to carry out a more democratic and progressive agenda, including nationalizing banks and energy corporations and advocating for participatory democracy, ecological restructuring, and decent wages and pensions. Any progressive could support the reforms in this remarkable document. 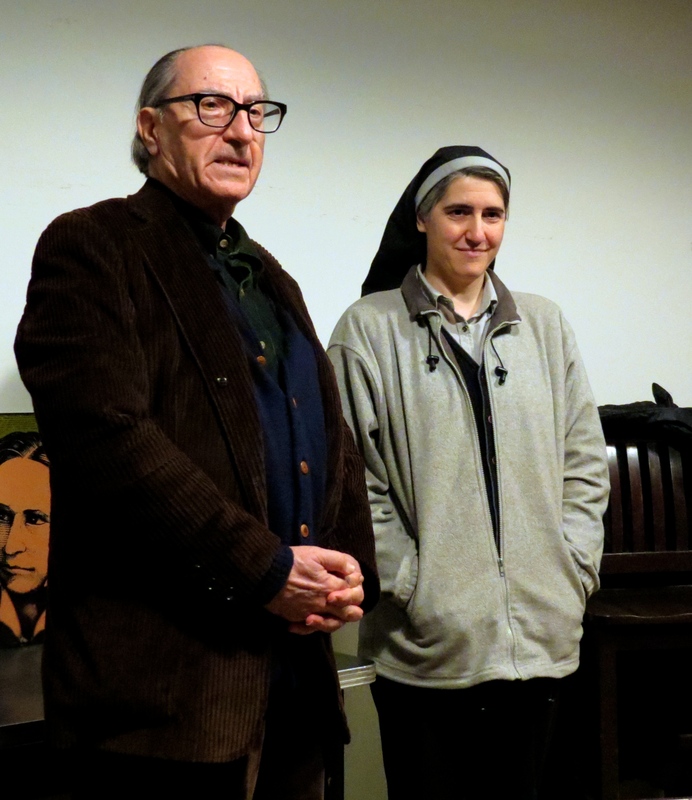 The program began when Professor Navarro from Johns Hopkins University introduced Teresa to the gathering. Teresa discussed many of the points in the Manifesto and the “Indignados” movement in Catalonia and Europe. Teresa emphasized four principles necessary for success in making social change. 1. Reactivation from below. Change has to be brought about from the bottom up. 2. Avoid centralized leadership and control. People should not look for a savior. They must work together to foster diversity and unity without uniformity. 3. Stress the urgency. A large percentage of the populations lives in poverty (30% in Catalonia) and a significant number are living at the misery line (12% in Catalonia). The misery line represents the threshold of not even enough money to buy food and shelter. 4. Engage in revolution and do it again. The revolution is not over with a few reforms. Citizens must take part in decision-making. The constitution should be an evolving document as changes are needed for social reform. After the question and answer discussion, I talked with Teresa and introduced John. I invited her to come to Swarthmore College as I know the students would be inspired by her dedication to social justice. I never expected that Teresa would be visiting in our area, so I have great hopes that we will see each other again in the future. The working conditions at the turn of the century placed workers under incredible hardships as they faced both health and safety risks on the job. At that time, half of all worker deaths occurred in two industries—coal mining and railroading. Around 1900 between 25-35,000 deaths and one million injuries per year occurred on industrial jobs. In the Pacific states a lumberyard or camp worker earned on the average 14 cents an hour with working hours averaging 61 per week. Employees had to sign a contract to waive all rights to damages in case of injury or death. Migratory workers depended on hopping on freight cars to follow employment opportunities across. Railroads estimated that 500,000 hoboes at any given time were attempting to board the trains. Migrant workers made up a large percentage of the 24,000 trespassers who were killed and 25,00 injured on the railway lines just from 1901 to 1904. Understanding that the root of this misery rested in the capitalist system, workers established a new kind of labor union. The Industrial Workers of the World (IWW) believed in organizing all workers. Ahead of their time, the Wobblies refused to accept the society’s racial, ethnic and class prejudices and welcomed the most dispossessed into their ranks. They possessed a revolutionary spirit which provided the catalyst to create greater democracy through worker participation. The I.W.W. 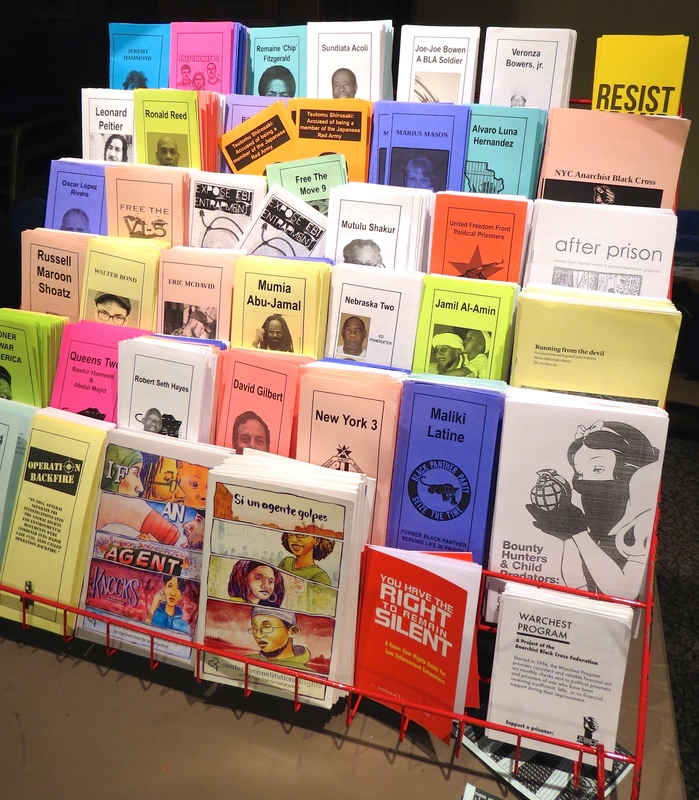 organized the free speech initiatives to prove that direct action was the mechanism to stand up to the Establishment on labor rights. The system threw every weapon at the I.W.W., and the courts, police, newspapers, even encouraging mob rule. The politicians and industrialists formed alliances to protect their business interests and profits. The public sometimes becomes confused with the rhetoric and propaganda of I.W.W. opponents who claimed that the organization despised the Constitution and rejected traditional American values and ideals. To understand this criticism it is important to differentiate between economic and political systems. Capitalism is an economic system, and the U.S. Constitution provides no support for any economic system. The I.W.W. rejected the elitist business interests of the capitalistic class in favor of workers. Elites labeled the I.W.W. unpatriotic because the membership refused to fight against their fellow workers in other countries. Translated: the I.W.W. is a bastion of democratic principles and follows an ethical philosophy of the highest calling: to join in solidarity with all workers and put an end to war.